Since I’ve been having some issues with my skin lately, I figured I might as well post about it. This way maybe someone with a similar problem can see what I’m doing and if it has helped any. I will update the progress in a few weeks! First off, I have oily skin and have had acne problems since probably middle school. Being in my 20s now I figured I would be cleared up by now. Most of my skin is pretty clear and has gotten so much better. 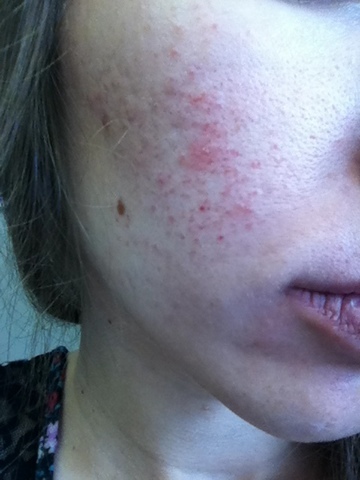 It seems my acne has migrated haha! It was mainly my forehead when I was younger, then it went to my cheeks but more on the sides. Now that has seem to clear and the only spots I have are ones right on the front of my cheeks, which I had never had problems with in the past. It was confusing me because I change up my routine and products and the rest of my face looks great. So the more I looked at these spots the more they just look like my pores were clogged. So I tried some scrubs and masks, and it wouldn’t really do much and again the rest of my face was looking awesome. 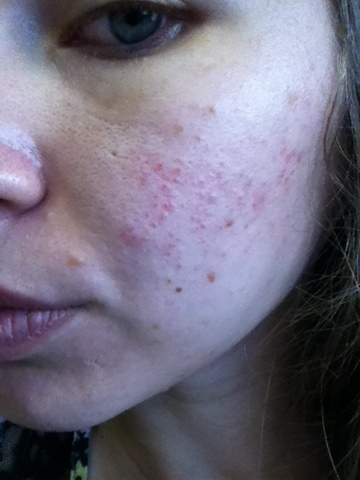 I finally, after months and months, went to the dermatologist on Monday! It was covered by my insurance except for a 40.00 copay, so I was thinking why didn’t I look into this a LONG time ago! Well I can tell you one reason why. It seemed like the times I had gone to a dermatologist all they wanted to do was put me on some pills, that never worked for me. This was a newer dermatologist to the area who I had heard good things about so I gave it a try. I was originally just going in about my face, but I figured I’m already paying for a visit so I might as well knock out any other concerns! So i did, I had her check out spots on my skin, moles, and some warts (yuck)! I was very happy with the visit because I felt like they weren’t trying to just prescribe me crap and sell me on a bunch of expensive stuff. They told me to wash with a benzoyl peroxide face wash, gave me a retinoid cream, and recommended some good moisturizers for me. So with these new products, a few I have to go get today, I will show you my progress and tell you how they work for me! I’m excited because I feel like this is going to work well for me! The Benzoyl Peroxide face wash will be used once a day whenever I shower and the retinoid cream every 3rd night until my face can handle it more often. Let’s hope this works well for me, I have a feeling it will! I’ll keep you updated!